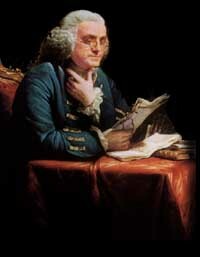 Benjamin Franklin was the most famous American in his day. Wherever he went, crowds formed. People worldwide pictured Franklin when anyone said, "American." Copyright Independence Hall Association. Used with permission. July 2006 marks the 230th anniversary of the United States of America. Thus, it seems an appropriate time for this issues's feature of the Independence Hall Association (IHA) web site, ushistory.org. As a significant owner and publisher of Philadelphia and 18th-century American-related "content," the Association's focus is on two fronts. IHA is devoted to providing information via the World Wide Web that educates, inspires, and entertains visitors worldwide with the importance of Philadelphia both historically and into the present. IHA is concurrently devoted to working with other historic and tourist organizations in Philadelphia to help bring visitors to this most venerable and vibrant of American cities. One of the primary goals of the IHA has been to reach historic-minded people from America and abroad who are interested in the stories, people, and events associated with the founding of the United States. Further, the Association wants to reach out to those interested in learning the principles of liberty and democratic government that first emerged and became reality during the Revolutionary and Constitutional periods in Philadelphia. In the 1700's, a favorite amusement was to write rebus letters. Pictures represented words. 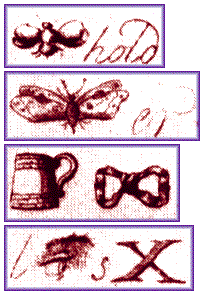 The above four examples are all from a letter published by M. Darly in 1778. Copyright Independence Hall Association. Used with permission. And, in addition to those twelve, there are currently just over two-dozen others that make up what IHA calls its "Congress of Websites". Each of the topical web sites included in the "Congress" is made up of myriad resources in text, image, and multimedia formats. Some resources are available in languages other than English as well. Throughout ushistory.org, you will find educational resources for teachers and students, including experiments, puzzles, and games (for example, a game of checkers with Ben Franklin and the Rebus game). The ushistory.org web site is located at http://www.ushistory.org.